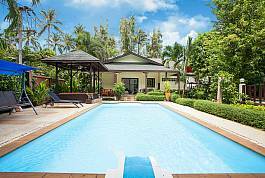 Perfect for a group of friends that care for a bit of privacy while holidaying together, this villa features five standalone buildings and great amenities. For starters, the lush tropical garden is home to a swimming pool plus a Jacuzzi pool, and the nearest beach is mere 300 meters away. 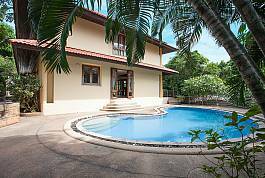 Spectacular 5 bedrooms pool villa in Tongson bay, less than 5 minutes walk to a private sandy beach. 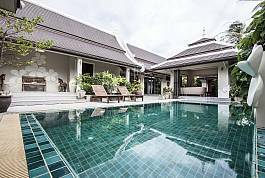 This 2-story villa is situated on the quiet side of Koh Samui and recommended for those who would like to stay away from the crowds. This fashionable yet warm villa is a true holiday treat for a large family or a group of friends. 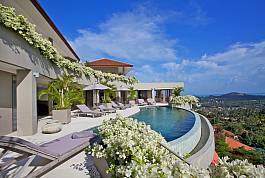 Designed with passion and inspiration, the summer home features breath-taking panoramic views of the nearby Big Buddha Bay, private swimming pool, superbly decorated rooms, and an overall aura of happiness. 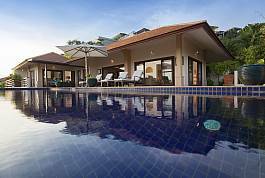 Cape Summitra Villa is a beautiful 5 bedroom holiday home which sits on a hillside overlooking Choeng Mon beach. The constant, stunning views you will have go hand in hand with the spacious comfort of the villa’s 3 levels. The 18 metre infinity swimming pool offers 180 degree ocean views, there are some wonderful outdoor relaxation spots and the interior is everything you would expect from a luxurious tropical island residence. When staying at the stunning 5 en-suite bedroom Summitra Panorama, you can welcome a new day by watching the beautiful tropical sunrise, and as dusk descends you can watch the gorgeous sunset that signals the start of another night in paradise. You will have the pleasure of these two magnificent natural spectacles due to the 360 degree panorama and wonderful design of a holiday home that will exceed expectations. 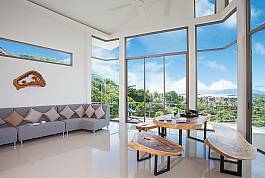 Its architecture is modern tropical while its 3 storey's offer superb south-east Asian decoration.